Over 25% of all Internet-connected networks advertise IPv6 connectivity. Google reports 49 countries deliver more than 5% of traffic over IPv6, with new countries joining all the time. Google reports 24 countries whose IPv6 traffic exceeds 15%. In some countries, major mobile networks are driving IPv6 adoption. In Japan (NTT – 7%, KDDI – 42% and Softbank – 34%), India (Reliance JIO – 87%) and the USA (Verizon Wireless – 84%, Sprint – 70%, T-Mobile USA – 93%, and AT&T Wireless – 57%) national mobile networks have very high levels of IPv6 deployment. Some mobile networks are taking the step to run IPv6-only to simplify network operations and reduce costs. IPv6 has emerged from the “Innovators” and “Early Adoption” stages of deployment, and is now in the “Early Majority” phase. The price of an IPv4 address is near its projected 2018 peak, and cloud hosting providers are starting to charge for IPv4 addresses while leaving IPv6 services free from additional charges for address space. Increasingly, IPv4 is an unnecessary cost, and a speculative asset. An IT department or CIO that is faced with purchasing IPv4 addresses has reason to ask whether the expense is worth the value. The short answer is that it increasingly is not. Even when not faced with that decision, the company would do better, in the long term, to sell the address space it has and use the money to fund IPv6 deployment, connecting to an upstream ISP that will use translation mechanisms to connect to remaining IPv4-only content. For those businesses and networks that have yet to make the upgrade, the best time to start the IPv6 deployment process is now and there are many resources available online to help. Reliance JIO, in India, started deploying IPv6 after its local Internet registry ran out of IPv4 address space. Reliance has been forced to purchase IPv4 address space as a result, but for business reasons prefers not to. As of February 2017, Reliance reported that about 90% of its LTE customers are using IPv6, and represent about 80% of their traffic. This is driven, they say, by their principal content partners, Google, Akamai, and Facebook, who deliver their content only using IPv6 in that network. Reliance activated over 200 million subscribers with IPv6 connectivity in just 9 months, between September 2016 and June 2017. Verizon Wireless proactively deployed IPv6 even though they had an existing IPv4 network. Per reports, they had at least 70 internal instances of the same private address space, and found themselves spending effort and money on the resulting network complexity; IPv6 deployment was a solution that simplified their network and reduced the cost of operating it. Over 80% of traffic from Verizon Wireless to major online content providers now uses IPv6. T-Mobile USA is similarly in the process of turning IPv4 off within their mobile network, operating IPv6-only. Facebook reports that they are in the process of turning IPv4 off within their datacentres; IPv4 and IPv6 from outside comes to their load balancers, and behind them it is only IPv6. The effect has been operational improvements and innovation in their software. Other companies, including LinkedIn and Microsoft, have similarly stated an intention to turn IPv4 off within their networks. Universities have also been early deployment test locations and early adopters. Virginia Tech, for example, deployed IPv6 in a trial location in 2004, and then expanded it throughout their campus system. In 2016, they reported that 82% of their traffic volume used IPv6. Similarly, Imperial College London reports that they started experimenting in 2003, secured commercial service in 2010, and in 2016 had SLAs for IPv6 service equivalent to their IPv4 service – averaging 20-40% of their traffic. Interestingly, they report that a significant proportion of their high-energy physics collaborations, such as with CERN, depend on IPv6. 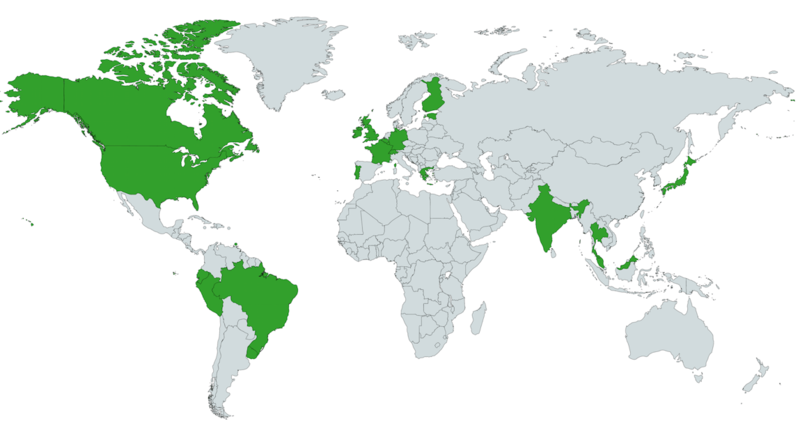 Google reports 49 countries using IPv6 for more than 5% of their interactions with them (up from 37 in 2017). APNIC, Akamai and Facebook report similar numbers of countries accessing their services using IPv6. 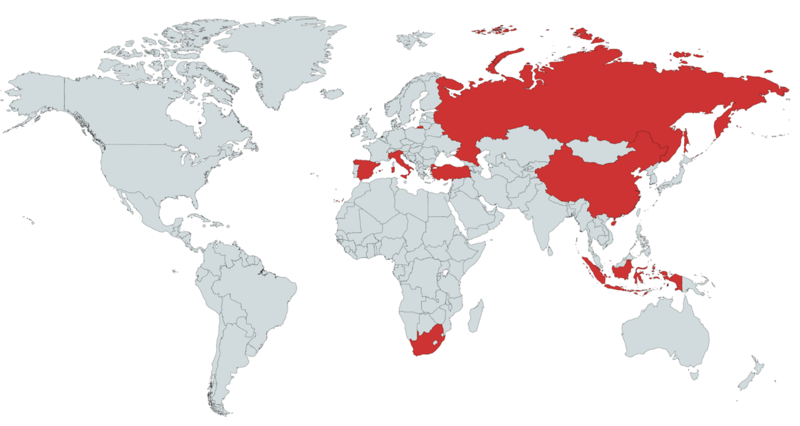 To get a sense of the relative numbers of IPv6 users in each of these countries we can refer to APNIC data about the percentages of the total IPv6 user population geolocated to these more-or-less IPv6-enabled countries. Special mention must be made of Belgium, the first country in the world to regularly deliver more than 50% of traffic to major content providers over IPv6. Deployment is global: Trinidad and Tobago is among what the UN calls “Small Island States” and is a recipient of development funding. But Google asserts that nearly 20% of accesses from there use IPv6. In the root domain, which is to say the service that provides the addresses for top-level domains (TLDs) such as .com, .org, .us, or .io, there are twelve companies operating thirteen root server identities (Verisign operates two). Each of these identities is dual stacked; it has both IPv6 and IPv4 addresses. There are 1,543 TLDs, of which 98.4% (1519) have IPv6 name server addresses and can be queried using either IPv4 or IPv6; an ICANN requirement of all new TLDs is that they be IPv6-capable from the day they launch. In total, across all TLDs, there are 11,4221,950 registered domains with AAAA records (up from 9,510,719 in the 2017 report). DNS clients use IPv6 for approximately 7% of requests seen at K Root. There exist 54,154 Autonomous Systems (networks) advertised in the global BGP routing database, as seen by Hurricane Electric. Of these, 13,947 (25.8%) advertise an IPv6 prefix, and 13,704 advertise both IPv4 and IPv6 prefixes. 243 networks only advertise IPv6 prefixes. APNIC also publishes a report on BGP and their numbers vary a little as the BGP database seen by any given operator differs from that seen by other operators but are approximately the same. Transit ISPs offering IPv6 services exist in every country, with the exception of parts of Africa, the Middle East, and China. Many broadband ISPs have IPv6 deployed to the majority of their subscribers and send the majority of their traffic over IPv6 to major content providers. For example, Comcast is actively deploying IPv6 in the US. Per the World IPv6 Launch website, Comcast has an IPv6 deployment measurement of over 66%. British Sky Broadcasting has IPv6 deployment in excess of 86%. Deutsche Telekom (56%) in Germany, XS4ALL (71%) in the Netherlands, VOO (73%) and Telenet (63%) in Belgium all have very significant IPv6 deployment. 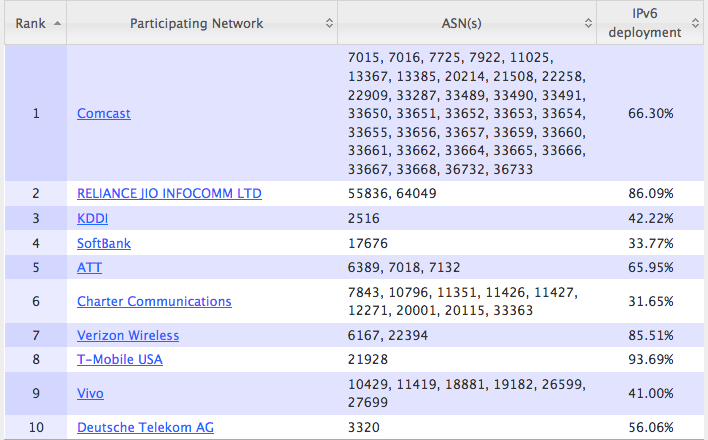 Again, we can refer to APNIC data to understand which ISPs have the most IPv6 users. 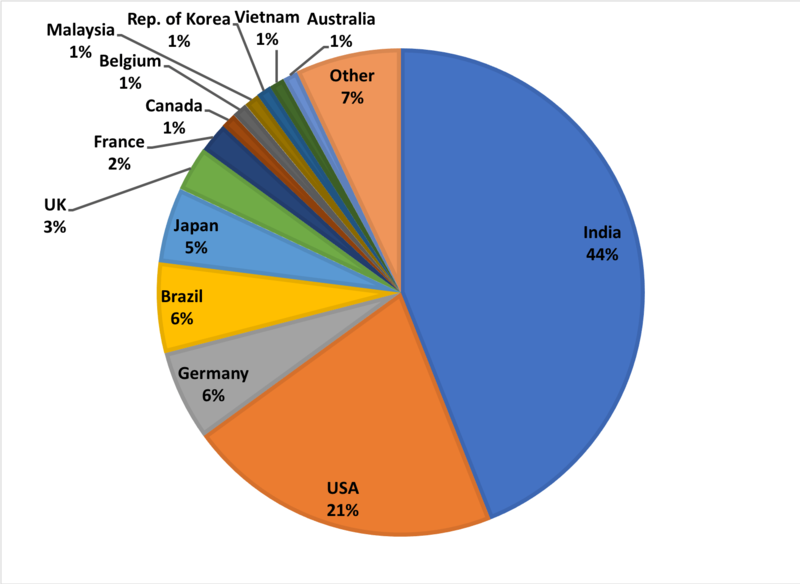 India and the USA currently dominate this view of IPv6 deployment. Reliance Jio may have more IPv6 users than all other IPv6-capable ISPs combined. Google, LinkedIn, Akamai, and Facebook are actively deploying IPv6 within their networks, and connecting to IPv6 users outside. An interesting point is that they report that delivering their services using IPv6 appears to improve user experience in terms of download times. IPv6-only datacentres are reducing operational complexity for these very large service providers. 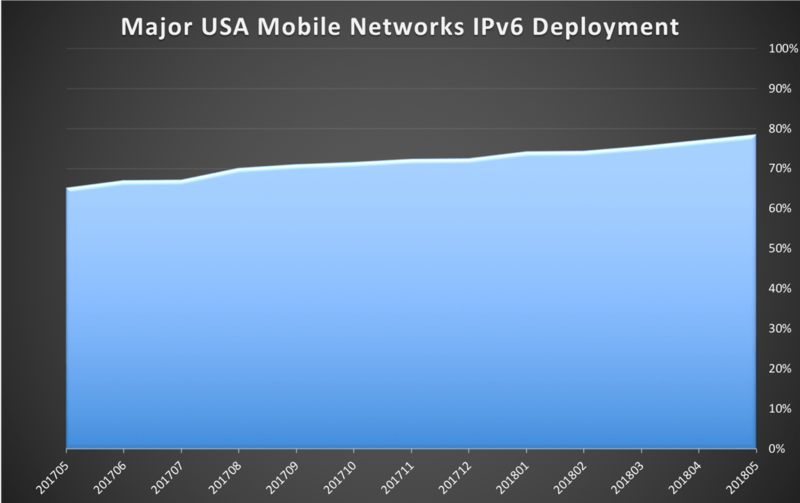 Mobile wireless, today, is rapidly becoming an IPv6-majority market. Reliance Jio reports that about 90% of its traffic uses IPv6, driven by its major content providers. Verizon Wireless similarly reports that about 90% of its traffic uses IPv6. T-Mobile USA is among the providers in the process of turning IPv4 off. Other major cellular IPv6 providers include AT&T Wireless, Sprint, Telus, Tele2, EE, KDDI, Softbank, OTE, Rogers and many others. Enterprise operations tend to be the “elephant in the room” when it comes to IPv6 deployment; if nearly 26% of AS’s advertise IPv6 prefixes, 74% do not, and those are likely to be enterprise networks. In other words, for Microsoft, turning on dual stack operation and then turning IPv4 off is expected to reduce cost and introduce efficiencies. It is the most sensible business strategy. As the case studies above illustrate, strong incentives for IPv6 deployment stem from the operational simplification that comes from removing overlapping address space from the network, the reduced operational costs of managing such complex networks, and the minimization of shocks to networking business that arise when additional address space is unavailable or requirements to deploy IPv6 arrive with a short time horizon. More work is clearly required to drive IPv6 deployment in countries, some of them major industrialised nations like Russia, China, Spain and Italy, that have not seen significant levels of IPv6 deployment to date. There is also significant opportunity for increased IPv6 deployment in countries that have already seen significant deployment. Many networks have IPv6 on their backbone but not to their end-users. Akamai reports that of the top 55 networks they interconnect with more than half have IPv6 deployment greater than 2% and these networks account for half of the residual IPv4 traffic that Akamai sees. Greater deployment efforts from this relatively small number of networks could yield huge increases in overall IPv6 deployment measured globally. As noted, networks worldwide are in the process of turning IPv6 on, and some are in the process of turning IPv4 off. An interesting business opportunity exists, given the current IPv4 market, to deploy IPv6 technology and then sell a company’s IPv4 address space to pay for the conversion. In that regard, the IPv4 space is a speculative asset; as the conversion progresses, in all likelihood the value of an IPv4 address will decay over time. The projections of the IPv4 Market Group may or may not be exactly correct, but the outline of the graph is assuredly correct; they assert that we can expect IPv4 prices on the market to start to decline in 2019. IPv6 Forum “IPv6 Readiness Logo”, Phase 1 for hosts and Phase 2 for network elements.